I hope everyone had a very merry Christmas! We did our usual tour of metro-Atlanta, visiting both of our families and attending multiple holiday parties. It was so much fun and so special to see our loved ones, but we are still exhausted! Not to mention Caroline was stricken with a double ear infection that caused conjunctivitis 2 days before Christmas. A small added stressor, but she is a trooper, and we were shocked to hear that she had ear infections because she was acting totally normal. We also enjoyed a white Christmas in Atlanta this year - so much fun! Anyway, Santa was good to all of us this year, and I received several fun cooking-related gifts. I can't wait to play in the kitchen! 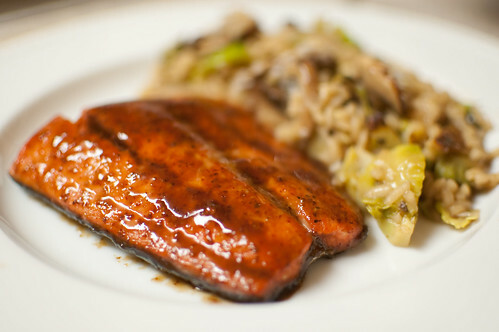 In the meantime, I thought I would share this glazed salmon recipe. I don't know about you, but I certainly did my share of overindulging over the weekend, and all I could think about afterward was how much I wanted vegetables. I've been trying to be conscious of preparing healthy meals when we're not at parties, and this salmon was one of the dinners we had last week. It was quick and is relatively healthy. I served it with risotto with brussels sprouts and mushrooms (light on the butter and cheese), but I think in the future I'll just stick with roasted veggies - keeps it lighter and easier. I still really love my apple horseradish-glazed salmon, but this is a great recipe as well. This was a hit with both Joey and Caroline, and it's a nice salmon recipe to have in my rotation. Whisk together all the ingredients in a small saucepan. Bring to a boil over medium heat and cook for about 1-2 minutes, until thickened and syrupy. Remove from heat and cover to keep warm. Combine the brown sugar, salt, and cornstarch in a small bowl. Pat the salmon dry with paper towels, and season with pepper. Sprinkle the brown sugar mixture evenly over the salmon, rubbing to distribute evenly. Heat the oil in an oven-safe nonstick skillet over medium-high heat until just smoking. Place salmon, skin-side-down, in the skillet, and cook until well-browned, about 1 minute. Use a spatula to carefully flip each fillet, and cook on the skin-side for 1 minute. Remove the skillet from heat and brush the fillets with glaze. Transfer the skillet to the oven and cook until the thickest part of the fillet registers 125 degrees, and is just translucent with cut with a paring knife, 7-10 minutes. Transfer salmon to a platter or plates and serve. this is going on my menu asap! do share what you served it with, the rice in the background looks equally delicious! I've had this one flagged in the recent issue of CI too! Yours turned out beautifully - glad it was a hit with your family. Jes, yes I served it with risotto with Brussels sprouts and mushrooms. It was very good as well, but like I said in the post, I'll probably just do rice and roasted veggies in the future. It was a little stressful working on the risotto and the salmon at the same time. This looks great. We have leftover pomegranate from Christmas, so this would be a great use for it! I'm making a variation on this recipe. You inspired me to make Pomegranate Balsamic Glazed Tofu. It's marinating now, but I'm excited to try it. The Dijon is a great touch!